Recently I had an experience of playing at an online casino. Yes, you read it right, it was an online casino. For those of you who have the experience of playing at real casinos and looking for a similar action on the internet, I would suggest you head to an online casino. An online casino is a buffet of casino games, which are run by computer software. 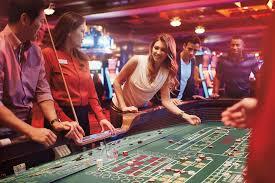 However, there is a Live Casino offering also, which brings the real-time gaming action live to gamers. Live Blackjack, Live Roulette, Live Baccarat are some of the popular games offered in this format. This has been possible with the advancement in HD Video streaming and other related technology. While online casino games use software controlled Random Number Generator that decides the outcome of these games, Live games are a replication of the real casino games which are relayed over the internet in real time. The variety in terms of games available at a real casino is significantly less. Though there may be more tables of popular card and table games, the variations of the same are quite limited. However, this drawback is slightly addressed as the online casino operators offer a wide range of games on their sites. You can find that games like Blackjack, Baccarat, Roulette, Dream Catcher and Three Card Poker are ubiquitous on online casinos. The online versions of these favourite casino games follow the basic rules of their real-world counterparts. However, there are variants of each of these games which have a few added features. Humanity, from time immemorial, has been involved in activities which provide thrill and excitement. Gambling is one such activity and it is pretty difficult to trace its origins. However, for a large period in history, it had been considered a taboo or immoral activity. Human Society has passed that phase and now governments around the world are legalizing betting and related activities. It was only in the 18th century that gambling became an organized activity with the birth of land casinos. Thus, started the age of casino games and gambling diversified into several streams. Betting branched out into other human activities which involved a chance or luck factor determining the outcomes. And that was how betting on sports came into vogue. At this juncture, the online gambling industry is a huge business worth billions. The industry has established itself on online platforms, with more and more innovative games added to the assortment regularly. The software for games and the related technologies are worth noting in writing about the gaming industry. The software supplier segment has grown to such a big extent that we today find there are numerous competitors trying to gain an edge over each other. NetEnt, Playtech, Evolution Gaming, Microgaming and Pragmatic Play are few noteworthy companies in this sector. They have been dishing out new software for games consistently using cutting-edge technologies. There is no looking back and the industry is poised to make a bigger impact with gaming laws being smoothened around the world. Probably two decades back, it would have been a weird thought to imagine playing games on a handheld device at the players’ comforts. Online gaming which started off with the desktop has now branched out to include smartphones and tablets. A decent mobile device and a stable internet connection are all that is needed to experience gaming on the go as of today. Going forward, we can expect the industry to expand into newer markets and provide gamers with an enhanced experience online.